Like Honda’s Type R variant of cars that appeal to Ah Beng racer boys who like to bully weave in front of Miss Loi’s demure little car on the expressways, Trigonometry has its own “Type R” model in the form of the R-Formula that was unveiled in this year’s New AMaths Syllabus. The diagram shows two right-angled triangles with their right angles at B and N. The sides OB and AB are of length 6 cm and 2 cm respectively. The lines OB is inclined at angle θ to ON. The line AM is perpendicular to ON. Express OM in the form OM = R cos (θ + α) and calculate the values of R and α. Find the value of θ for which OM = 5 cm. In the diagram, state the line with a length of R cm and the angle with a value α. Express AM in terms of R and (θ + α) and show that the area of triangle OAM is 10 sin 2(θ + α). Given that θ can vary, find the maximum value of the area of triangle OAM and the corresponding value of θ when this occurs. a cos θ ± b sin θ = R cos (θ ∓ α) – look out for that inverted plus/minus! Do note that the R-Formula highlighted above is NOT a given, especially when the relevant part of the question carries a high weightage of marks e.g. (-3) cos θ + (-2) sin θ = 3 → WRONG! 3 cos θ + 2 sin θ = -3 → CORRECT! YAY! Please, please, please, please, please for the addition cases (i.e. a cos θ + b sin θ or a sin θ + b cos θ) you can simply re-arrange the sine and cosine terms depending on how you wish to express the R function in your question. Hailed as the pinnacle of O-Level Trigonometry, a typical R-Formula question may also require your skills on lesser trigonometry variants such as the Addition Formulae, or the Double Angle Formulae, or the Factor Formulae, together with your knowledge of basic angles (e.g. in question 1 above when you’re asked to find all angles within the range of blah blah blah). But once you tame it, you’ll be rewarded with a straightforward ride and zoom away with plenty of marks. So are you ready to test-drive your R-Formula with the two questions above? 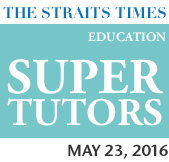 Miss Loi doesn’t expect you to crash this in your O-Level in two weeks’ time! N.B. Once again, Miss Loi does NOT advocate nor encourage speeding or any form of street racing in Singapore. This is where many students get pwned and forget that All Science Teachers are Crazy (ASTC), as the question asks for ALL values of x in the range of 0° < x < 360°. But we shall take only x = 247.4° since 0° is not in the range of 0° < x < 360°! Think you've made a careless mistake here but Miss Loi won't know in her lifetime the cause of it since your workings are absent! AM = R sin (θ+α) ----- (2) simple right??? But if you read carefully again, Part iv. only requires you to express in terms of R and (θ+α) (vs Part i. which required you to calculate the values of R and α). So strictly speaking you shouldn't replace R and α with their actual values in your answer at this point. Sub in R = √40 obtained from Part i. = 10 sin 2(θ + α) YAY! Marks are usually served to you on the platter in the Maximum/Minimum parts of R-Formula questions so DON'T EVER 对不起你自己 and skip this part! 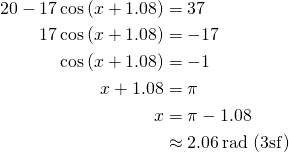 From the notes above: The maximum value is R which occurs when cos/sin (θ ± α) = 1. Hey Anoneemers, Miss Loi has commented on your test drive of the Trigo R-Formula questions. Regarding the symbols, Miss Loi was taught from the start to reference this table. But after awhile it became pretty intuitive e.g. for α you type &alpha;, for β you type &beta; etc. But having said that, copy and pasting still seem to be the quickest! Used to take a long time remembering this when I did A levels, and until now still cannot figure out the logic behind all those steps used to derive the Rsin and Rcos. mathslover: As far as Miss Loi can recall (please correct if she's wrong though), the R-formula was only removed from the A-Math syllabus between 2002-2007, as she could still remember herself utilizing the R-Formula diligently when she was still a kawaii teeny Sec Four school girl. So her kaypoh guess is you're around 18-23 yrs-old? Oh wait ... but you know how to do Plane Geometry questions! Miss Loi: Actually, my O level year not within the range. Its the extraordinary year where matrices and vectors are out. Guess either u remember wrongly, or i was sleeping in A maths class..
Help! I can't get the answer for this question, 4sin3x + 3cos3x=√3. Tried doing the question for 2-3 times but still can't get the answer. Hello Rose, yours is really a classic a sin θ ± b cos θ = c trigonometric equation question. *Note: Since both terms on LHS are positive, and assuming the question didn't explicitly state which form to express in, you may also express it in the form of R cos(θ−α) but in this case your a=3 and b=4! To address your confusion of the "minimum and maximum thing", as Miss Loi has no further detail of your question, let's assume that we're looking for the max/min values of 5 sin (3x + 36.870°). Looking at your R-Formula expression of 5 sin (3x + 36.870°), can you see that it's also a sine graph when you let a=5 and θ = 3x+36.870°? Hence from the diagram above, the max value is 5 and the min value is −5. Does the answer tally with yours? Erm... Can you teach me how to find the max and min values of (5sinx - 12cosx)²? Hello again Rose and a interesting but nonetheless a pretty straightforward question you have! @AMath Student: Yes for e.g. in the TYS's analysis of the 2008 GCE 'O' Level AMaths paper, Trigonometry (Trigo functions, identities & equations, R-formula etc.) took up a whooping 39 marks (21.6%) of the total marks across Papers 1 and 2. Miss Loi is teta = 90°- alpha in the first triangle? sorry I was referring to the second diagram I didnot see the first one? @Jukie Primestein: Are you referring to this diagram? Can you please send me a few more variation of the roar R-formula. Based on a few times I encountered it it is not always clear if you are to find a maximum or minimum! Oh another question I have not seen any proof to convince me than cosine of a negative number is positive, but please don't get me wrong I know it is correct however a proof maybe through a diagram would really do the trick! which trig identity do you refer to as the factor formula? why cannot r be negative 5 in the exaple given ? I love your site and your sense of humour, definitely very localised. Anyway, a quick question to your type-R question 2, the part on maximum area of the triangle. Should we apply the maximum value of R at the length stage? meaning to AM and OM individually instead of applying to the area straghit? The maximum value of AM and OM exist when cos (θ + α) =1, Hence, maximum value for AM and OM should be √40. Hence, 1/2 times AM times OM should give us 20cm sq.? @Ray: Hello and welcome to Jφss Sticks, Ray! i.e. When OM is maximized when cos (θ + α) = 1, AM is actually minimized at this same value of θ since sin (θ + α) = 0. So the key here is we need an intermediate value of θ that will maximize the area instead of the individual lengths hence we have to obtain the ONE R-formula for the area using the double-angle formula etc. Hi. I was wondering if you can help me with these questions. 1. Find the minimum and maximum value of 20 - 8 cos x + 15 sin x and the corresponding x values for 0 ≤ x ≤ 2π. 2. Solve the equation |8 cos x - 15 sin x| = 6 for 0 ≤ x ≤ 2π. At this juncture, there'll be a insatiable urge to flip the centre term and make the careless mistake of flipping the inequality signs, +20 on both sides to get what you want i.e. @Im__Rachelx3 http://t.co/I9bQLPwL not so accurate but what is needed is there unless is not this R formula you talking about.